When it comes to mini diggers, you can think that they are all on equal terms. I used to think that the Dingo style machine was better because it was … red! (And now Toro fits the same category!) If speed is your aim, then go red. But if getting the job done is your goal then Kanga is the best product. Leg Protection. You’ll notice that the kanga enables you to stand within the machines outer contact area. This protects your legs from finding themsleves inbetween the machine and an object! Steel tanks. Many other machines have plastic fuel tanks. 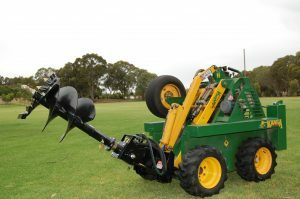 The Kanga Mini loader has steel tanks which increase its safety in the event of a collision. These are just a start of the operating features of the Kanga which set it apart. Book our machine now and discover the benefits yourself!